I love my morning coffee but tea is my comfort drink. When I’ve indulged too much and feeling a little bloated, I drink tea to sooth my stomach. When I feel under the weather with a flu or cold, tea comforts me. And when I’m hot and bothered, why that nice tall glass of iced tea is there to chill me out! 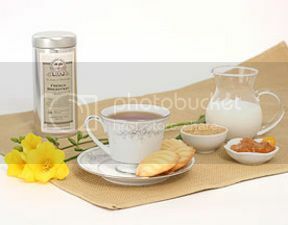 We’re going to be trying out Golden Moon Tea and will be posting about it here soon. You can check out their website at GoldenMoonTea.com. They carry a variety of teas to choose from: white tea, black tea, green tea, oolong tea and some very interesting flavored teas. This cool weather is just waiting for a proper tea, so stay tuned! I’ve been into organic dandelion tea…I started drinking it as part of my “immunity” enhancing routine (supposed to aid the liver and helps eliminate toxins). The taste has grown on me, it has a slight bitterness that isn’t unpleasant, like the bittermelon, literary bitter sweet 🙂 I’ll check this out tho, looks interesting.